Rifa eX 88 is the largest of the Lowel Rifa eXchange family. 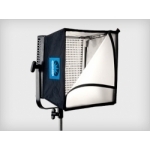 Its diffusion screen measures 32" square, making its output very soft. 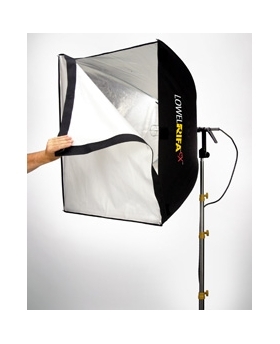 Use it with its supplied TH-X1000 lamphead and max. 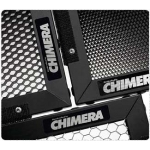 1000w lamp for highest output, or switch to 750 or 500w lamps for decreased output with the same level of softness. 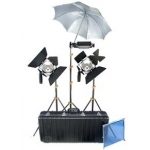 Its 60 second set-up gets you lighting quickly, while its collapsed size allows it to fit into many of our smaller kits & cases. 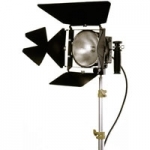 Enhanced with the abilities of the Rifa eXchange System, this light can quickly swap to accessory lampheads for lower wattage AC / DC tungsten-halogen, or to use our screw-threaded high CRI daylight fluorescents. 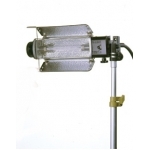 Dedicated softlight fixture with removable 1000w lamphead centered in collapsible silver aluminized high temperature Nomex® housing. 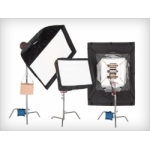 105 - 1000w available Tungsten-halogen range when combined with accessory TH-X300 lamphead. 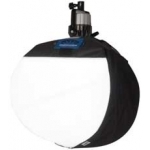 Other lamphead options for screw-in daylight fluorescent or incadescent also available. 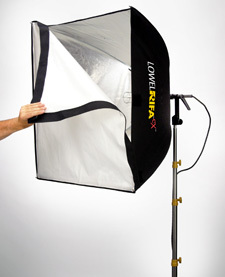 Umbrella-like design for quick 60 second setup & strike. 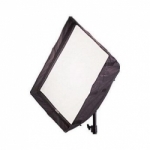 State of the art woven glass fabric front diffuser offers exceptional heat resistance. Front diffuser must always be used. 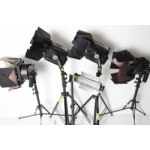 Light controlled with fold-up accessory fabric Egg Crates.